The workshop lasted 3 days and the price was unbelievably low! Of course the 55 mile drive to Salinas 3 days in a row was tiresome, and I used most of a tank of gas, so that kind of balances out the cost, I guess. On day 2 we painted waterfalls and rocks. 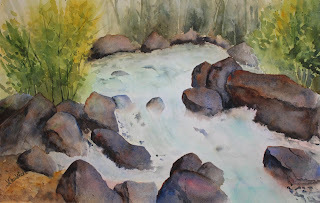 I used a picture I had taken myself several years ago in the Trinity Lake area, and that I have painted twice before. The rocks turned out interesting-the water not so much. Day3 we all painted Dale's barn photo. 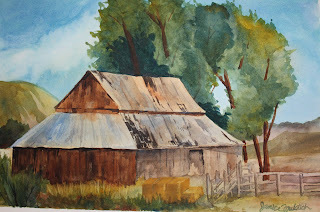 I overworked this poor barn and the eucalyptus trees behind it so abysmally that it's shameful. I enjoyed seeing his demos and will try to put some of his techniques into practice.